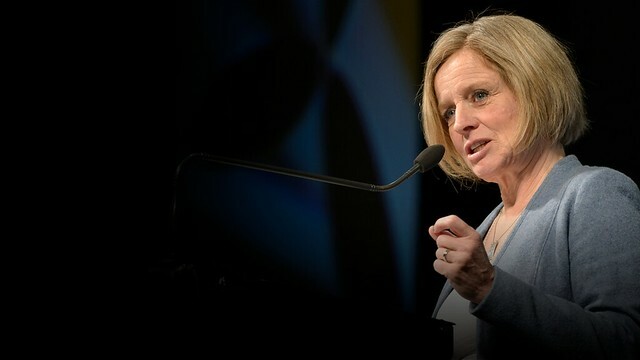 Premier Rachel Notley spoke to the Senate on Thursday, Feb. 28, 2019 and shared Alberta’s concerns about the Government of Canada’s Bill C-69, which would overhaul the environmental assessment and review process for major energy projects. I would like to begin by recognizing that we are on the ancestral land of the Algonquin people. I know that Premiers of Alberta don’t often speak before this committee – and things are pretty busy back home right now, but I just love Ottawa in the winter time and I couldn’t pass up the opportunity to be here. I have come to Ottawa because the issue before this committee – Bill C-69 – is extremely important to the people of Alberta. And quite frankly, we’re not being heard. With respect, people here – in our nation’s capital – just don’t seem to get it. So in my remarks today, I want to help fix that. I want to make the case as clearly as I can that Bill C-69 – as it is currently written – does not work for Alberta. And, therefore, it does not work for Canada. Now let me be clear: I don’t think the system Bill C-69 is intended to replace is any better. The former government’s Environmental Assessment Act was broken, misguided and damaging to our economy. So we agree that the process for approving infrastructure projects needs to change. We agree that Indigenous consultation and environmental protection are central to building trust in a modernized approval process. And we agree that in ignoring these things, for many years Ottawa failed the country and failed Albertans. And so the old way of doing things is not an option. But, Senators, we have to get this right. We can’t just swap one broken system for another broken system. We can’t build trust with more investor uncertainty. We can’t replace a “no pipeline” process under the former Conservative government with a “no pipeline” process under a Liberal one. But either by design, by willful ignorance, or maybe just by accident, that’s just what Bill C-69 does. Not because Albertans don’t share national ambitions for this country. Far from it. In Alberta we are nation builders. We contribute much to this country. In fact, we punch way above our weight. But a bill that harms Alberta’s economy undermines the very national ambitions it purports to advance. Now, I trust I don’t need to tell you how important Alberta’s energy industry is to the well-being of every Canadian. As I like to remind audiences around this country – there is not a school, hospital, road, bike lane or port anywhere in Canada that does not owe something to a strong energy industry. And so when Alberta’s energy industry is hurting, everyone in Canada is affected in some way. That’s true whether you live in Fort McMurray, Wakefield, or Victoria. Now, as you know we are coming through one of the toughest recessions in our history. And things are starting to get better. Our economy is growing again. New jobs are being created. The deficit is coming down – faster than forecast. And we have strong public services like health care and education. By getting our priorities right, in Alberta we’ve been able to cut child poverty in half over the last three years. And we have the lowest child poverty rate in the country. There is a lot more to do, and I won’t be satisfied until the recovery reaches every kitchen table. So our work continues. I am particularly encouraged by the new investments we are seeing in upgrading. Working with industry, the Alberta government has leveraged more than $12 billion to build new petrochemical and upgrading facilities that create jobs and add value to our resources. I am also encouraged by the big investments we’re seeing in renewables. Alberta is now one of North America’s hottest renewable energy markets. And because we are leading on climate action, not only are Albertans breathing much cleaner air, we are also positioning our economy for the future we know is coming. ...we can’t do these things if Ottawa makes it virtually impossible to build the energy infrastructure we need. We need them to move our energy products – and that is a good thing for Canada. In 2017, Capital spending by Alberta’s mining and oil and gas sector accounted for 20 per cent of private sector capital spending in Canada. And energy exports made up almost 14 per cent of Canada’s total merchandise exports. In 2017, the energy industry contributed $213 billion to the nominal GDP and employed 276,000 workers. But just last fall, our economy in Alberta faced yet another crisis. Why? Because we ran out of pipeline capacity. And that meant that the value of our energy dropped to roughly 20 per cent of the price we could have secured on world markets. WTI was over 50 dollars per barrel, while Albertans were getting under 10. At that point it was costing our national economy 80 million dollars a day. And so our government was forced to curtail oil production by almost 10%. In the Maritimes they were importing Saudi oil. Here in Ontario you were importing American oil. And in the West… we were curtailing production. This, my friends, does not a country make. And this is why we need to be far more strategic when it comes to building national economic infrastructure. As you know, there has been a great deal of discussion about Trans Mountain and its future prospects, and we are very pleased that this project continues to move forward. But let us just remember that the first application for Trans Mountain began in 2013 and six years later – in 2019 – we still do not yet have an approval and construction. This is not a way to build our economy. We must do better as Canadians. If we were more strategic we could be leading the world, not chasing it. We could be getting so much more out of our products then we do. But instead, we are forced to curtail production and lease rail cars to move our product. I think you can understand why people are more than a little frustrated and angry. Now we all know that the only long-term solution – the only lasting solution to this problem – are modern, well-regulated pipelines that move our products safely and efficiently. And for the past four years I have been making this case across the country, speaking to supporters, opponents and skeptics. And that work is paying off. Today, a large and growing majority of Canadians support Alberta’s fight to build a new pipeline. When we started, four in ten Canadians supported Trans-Mountain. That number is now seven in ten. As a result, when investors were scared off by British Columbia’s threat to take unconstitutional action blocking Alberta’s energy products from reaching the coast, the federal government stepped in and bought Trans-Mountain. For that, I give Ottawa credit. It is a national project that’s in the national interest – a fact underscored by the NEB’s decision to re-issue its approval certificate last week. So why Ottawa would do that – invest $4.5 billion dollars in a pipeline – while, at the same time, propose Bill C-69…. …well it just leaves us shaking our heads. So I’m here today, in good faith, as a fellow Canadian, ready to have a reasonable conversation, to answer questions, to address concerns, all in the name of building a national consensus, not pitting people against each other. It is the hard work of nation-building in a country like ours. So here’s what you can do to help. Let me begin by saying that our government supports the need for institutions to build greater public trust while at the same time improving clarity and certainty for proponents. That is why we believe significant changes need to be made to Bill C-69 in order to ensure these objectives can be met. Before I get into particular areas of the bill that need to be improved, let me also say that we support the intention of the proposed amendments from industry as they relate to parts 1 and 2 of Bill C-69. But, in addition, I would like to offer you a few amendments that would make a big difference and show that Ottawa gets it. And, so you know, I have laid this out in a formal submission in considerably more detail. As well, we would like the Government of Canada and the Senate to consider these amendments as a comprehensive package. In order for Bill C-69 to be successful, we believe that the entire suite of amendments must be adopted for the good of Alberta and the entire nation. First of all, I know there has already been a great deal of discussion around the project list. In the absence of a clear written commitment around what will be on that list, we are proposing that the Impact Assessment Act, or IAA, be amended to exclude specific project types. In particular, we would like to amend Section 4 of the IAA by adding a new subsection that excludes in situ, intra-provincial pipelines, all generating units using natural gas, renewable energy projects, and refining, upgrading and petro chemical facilities. These proposed changes are vital for the continued success of Alberta’s energy sector. By adding our proposed subsection, the Government of Canada would ensure that existing projects, pipelines and in-situ facilities are not subject to additional oversight. …refineries and all generating units using natural gas as their primary fuel. While it may seem that this is a long list of items to be excluded, we believe that such an amendment would recognize the oversight and regulation that is currently built into our provincial system. In order to provide additional clarity to the draft of the Impact Assessment Act, we request that Section 22 be amended. These changes would allow approvals to run smoothly. Currently the section contains a number of new terms, not seen previously in the document, and our concern is that they could be open to interpretation and therefore additional legal challenge. For example, instead of saying “the changes to the environment, or to health, social or economic considerations” we suggest the act be changed to focus instead on the “effects on federal jurisdiction,” as this is a term that has previously been used and about which there is already legal consensus. There are a number of additional wording changes that have been submitted in our written proposal. Overall, the changes we are proposing to this section are designed to provide greater clarity and less opportunity for litigation. In order to ensure that project approvals are not caught in an endless loop of delays, we are suggesting that there be an amendment to section 62. This would provide a hard limit for the completion of assessments. …and a 300-day limit for pipeline and other life cycle regulator assessments, including an ministerial order delay. I understand that concerns have been raised that there could be unintended consequences where a proponent is seeking a delay. If this is a genuine concern, the answer is to include a provision that would allow for an extension at the request of the proponent. This would significantly narrow the discretion of the minister and provide much greater certainty in terms of timelines. These timelines would allow for substantial and full reviews to be completed, while still ensuring that projects can proceed strategically. As a province, our message has remained consistent and clear. We believe that it is important to create a system of policies that grow the economy and protect the environment. From a personal perspective, it’s my view that pitting economic progress against environmental responsibility is a recipe for failure on both fronts. We believe that Alberta’s Climate Leadership Plan allows us to move forward in a way that protects our environment while promoting economic prosperity. The Climate Leadership Plan is a robust, made-in-Alberta strategy that diversifies the economy, creates jobs and reduces the emission of greenhouse gasses that cause climate change. It provides, clear, stringent regulations to ensure that industry is meeting provincial greenhouse gas emissions objectives. Alberta’s plan reduces methane by 45%, taking an incredibly harmful greenhouse gas out of our air. It also phases out all coal pollution by 2030. Given that Alberta burns more coal than the rest of the country, this is a major step forward. In 2018 alone, emissions dropped by seven megatonnes. That’s the equivalent of taking 1.5 million cars off the road. Our climate plan has also transformed Alberta into one of the most sought after renewable energy markets in all of Canada, if not North America. And we are setting record lows for renewable energy prices – at the same time we have more than doubled our renewable energy capacity. And most importantly for today’s discussion, it provides for a legislated cap on greenhouse emissions. If Bill C-69 is to move forward, we request that Alberta’s Climate Leadership Plan be formally recognized. This recognition would mean that projects approved under our Climate Leadership Plan meet federal standards and would be exempt from further assessment, unless there were significant impacts in other areas of federal jurisdiction. In addition, on the matter of greenhouse gas emission generally, we also request that the act be amended to specifically exclude downstream emissions. While we have been given generalized assurances in the past, the act of signaling an intent will not provide the level of investor certainty that we believe is required to make progress on important economic infrastructure. Another means of ensuring timeliness is to provide greater certainty around the scope of public engagement. In the absence of clarity regarding the panel’s authority to rely on its expertise to define the scope, this could end up being a source of ongoing litigation. As such, we would like the panel’s authority to be clarified in the legislation. Details surrounding these amendments have been outlined in Alberta’s written submission. As we have repeatedly stated, we believe that the IAA must ensure the federal government is acting in the public interest as they evaluate potential projects. As written, the Act does not take into account the economic and social benefits of a project under review, and this is a major misstep. We are aware of the argument that these issues are embedded in the definition of sustainability. However, it is our view that the consideration of economic and social benefits should be elevated within the statutory language in order to ensure adequate weight is given to these matters. As a result, we propose an amendment that would include specific consideration of economic and social benefits in the public interest. Projects should be rewarded for creating good jobs for Canadians, which in turn help grow the provincial and federal economies, and create resilient families and communities. We believe that socio-economic benefits of a project should absolutely be evaluated as a way of measuring if the project is truly beneficial for Canadians. Madame Chair, Bill C-69 also provides for broader strategic policy assessments. In many cases these will apply only to provincial and national jurisdiction, such as in the case with climate change, as a result it is critical that legislation specify that provincial membership is required on the advisory councils envisioned under section 117 of the Impact Assessment Act. When it comes to panel reviews, the expertise of lifecycle regulators cannot be overstated. As such it is our position that there should be significant representation from the lifecycle regulator on panel reviews. This is an example of good governance, and would allow for informed decisions to be made. Finally, we are recommending the IAA limit the Minister’s discretion to add projects to the existing project list. …it would simply ensure that projects are only added if there is a significant potential adverse effects within federal jurisdiction. Again, this would maintain clear lines between federal and provincial jurisdiction, and would ensure there isn’t a duplication of efforts or a serious stall in project approvals. Madame Chair, as I said at the beginning of my remarks, changing the way Canada approves infrastructure projects is long overdue. But one broken system should not be replaced by another. Bill C-69, therefore, must be fixed. I say this as the Premier of Canada’s largest energy producing province – a province that is an economic engine for the country. I say this as Premier of Canada’s leader on climate action – a province that is showing that economic growth and environmental protection can – and must – go hand in hand. And I say this as Premier of a province that wants to unite, not divide this country. Again, thank you for the opportunity to be here today. I trust in your deliberations that Alberta’s concerns will be acted upon.